When I was accepted into Cornell’s Viticulture and Enology program in 2011, I eager for the Fall 2011 semester and for my first VIEN courses to start. As I looked at the curriculum and requirements for graduation, I saw that I needed to complete a capstone project. I brain-stormed during my freshmen year on what I would do; in November 2012, I came up with the concept of Redhead, a new line of wine with a modern label. I decided to use Redhead and record the process of initiating a new wine into the market. I did not expect for Redhead to gain such popularity in the few short months it has been available; Redhead was launched October 2013 at L’uva Bella Winery. For my capstone, I have kept a journal that recorded each step of the process including the concept, label approval by the TTB, deciding on the wine style, the winemaking process and how I gained resources to help my wine become successful. I recently was selected to receive advice from start-up companies, Hello Perfect and Successify, which discuss with me how to make my product successful. Both suggested that I create a twitter handle for Redhead (@Redheadwine) and an Instagram account (@Redheadwine) to gain an audience. A wine blogger in California, Brittany Levine, who writes for Wine for the Win blog, recently reached out to me. She featured me in one of her posts. I have included a link here: http://wineforthewin.com/2014/01/15/marisa-sergi-the20-year-old-vintner/ I am glad to see that my capstone project is doing well and I encourage all VIEN students to attempt to try to work on projects that they can potentially use for research or carry over to their jobs when they graduate. Hello VIEN students, hope you’re all enjoying your break. I was recently interviewed by the National Public Radio show, ‘Science Friday’, for a video feature on wine flavor chemistry. You can see your Teaching Winery in the background of much of the video . . .
Feel free to fact check my interview, but bear in mind that no extra credit will be awarded for finding errors. 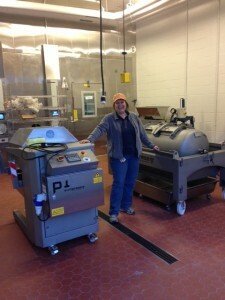 This week saw two big additions to the Cornell Teaching Winery with the arrival of the new grape presses, which will begin to be used to process fruit in enology classes. The Scharffenberger presses, distributed by Europress, are the first units of this size in the United States. These very small scale, research grade, membrane style presses are small enough to be used on student winemaking projects, but have all of the features of the most advanced production scale models. With both manual and automatic modes, students will learn about processing factors which impact juice quality. One press has a volume of only 100 L with an open tank, while the second one has a 300 L capacity with a closed tank and internal drain channel. Justine and Kathy are trying to get an idea of student interest in the Sustainability and Organic Grape Production and Wine Making course. We need at least 8 students for this discussion-focused course to work well. Please let us know if you plan to add this class, after reading the following description. HORT/FDSC/VIEN 2204 is a pre-req, or permission of instructors. VIEN3120 is a 2 credit course focused on sustainability in the wine industry. We believe this is the first university/college level course to focus on sustainable grape growing and wine making practices. This is an increasingly important issue in the grape and wine industry, and we believe that students should familiarize themselves with the relevant issues. With the new V&E curricula, this course counts as one of the major electives. The class meets Tuesdays, from 12:20-4:20, though many weeks, the meeting time is shorter to allow students to work on projects. This course has a different format than most of our other courses. Students spend a good deal of time reading assigned literature (science journal papers, book chapters, popular press articles) and discussing the readings in 5 of the class sessions. Discussions are usually approximately two hours. There is extra time built into the course (i.e., credit received for work outside of class meetings) so students can work on developing a vineyard management plan for the certified organic vineyard plot at the Orchards. There are a few field trips planned for the course. Some weeks, we meet for 1-2 hours in class and some weeks, the full 4 hours (lecture and lab slots) are used. Students work cooperatively to come up with the management plan for the organic vineyard for the following year, and we hire a student intern to work in the vineyard for the summer. Please contact Kathy Arnink <kja1@cornell.edu> or Justine Vanden Heuvel <jev32@cornell.edu> if you are interested or have questions about the course. Returning from a presentation in Vienna (Austria) I noticed that CALS has an exchange agreement with the University of Natural Resources & Applied Life Sciences of Vienna, or “BoKu”, as the locals call it. You can find information about the program and how to apply on this CALS page. BoKu has a very strong Agriculture and Food Science program, as well as Viticulture and Enology classes. You can find an overview of their courses here and the main page of the department here. A number of courses are held in collaboration with the State Research Station at Klosterneuburg, a short train ride away, and right next to the monastery Klosterneburg. I was able to visit their new teaching winery and it is among the best I have seen worldwide. Needless to say that the city of Vienna is beautiful. Please contact me if I can assist beyond the CALS information pages provided. The new edition of Appellation Cornell features two viticulture and enology students who worked with Cornell faculty this summer – Appellation Cornell Issue #11. 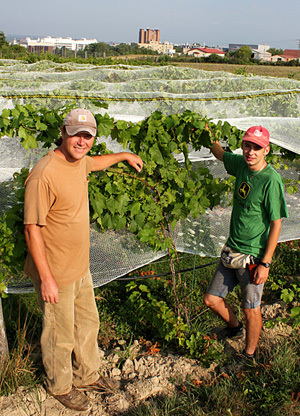 Eric Shatt, left, Cornell Orchards farm manager, and summer intern Joe Young ’14 adjust bird netting to protect fruit in the organic vineyard adjacent to the Cornell campus. A block of about 500 grapevines at Cornell Orchards — a little more than half an acre — is now certified organic by the Northeast Organic Farming Association of New York. “Virtually all of the management, from planning and planting to harvest and winemaking — even the paperwork — is done by students,” says Justine Vanden Heuvel, assistant professor of horticulture. The planting grew out of the two-semester course Sustainable and Organic Grape and Wine Production (HORT/FDSC/VIEN 3120/4120). “We started the course in 2010 because viticulture and enology students told us that they wanted to focus specifically on sustainability issues,” says Vanden Heuvel. “That’s something you can’t just learn in the classroom. You have to go out in the vineyard and do it. “To our knowledge, we are the only university in the country with a student-run organic vineyard or a course devoted entirely to organic viticulture,” she adds. During the spring semester, students develop a management plan for the season, from improving soil health to coping with weeds, pests and diseases. All the practices must comply with U.S. Department of Agriculture organic standards. The students prune and tie vines to the trellises, and one serves as an intern to carry out the plan through the summer. 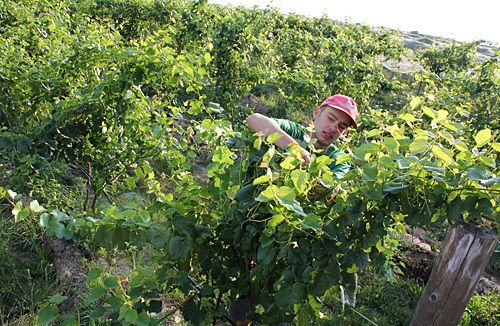 Students planted the vineyard in 2010. Many of the vines are NY95, a new variety developed at Cornell that’s particularly well-suited to organic vineyards due to its resistance to diseases such as downy and powdery mildews. Other varieties in the planting include such cold-hardy wine grapes as Frontenac gris, Marquette and Maréchal Foch. The young vineyard will likely yield about a ton of grapes for its first harvest this fall. It should be in full production in 2014, when Vanden Heuvel estimates that it will yield 3 to 4 tons of grapes, or the equivalent of about 180 to 240 cases of wine. During the fall semester, Kathy Arnink, lecturer in food science, will take the lead in the class when students harvest the grapes and turn them into organic wine in the Teaching Winery at Cornell Orchards. “When we’re at full production, we’ll probably use a quarter to half of the fruit in class and the rest we’ll sell to home winemakers through Cornell Orchards,” says Vanden Heuvel. 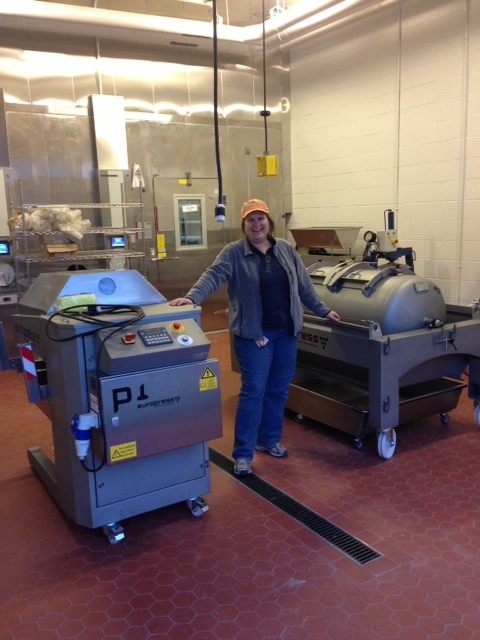 Intern Molly Smith ’12 did the paperwork for organic certification as an independent study project in 2011. The process went smoothly, notes Vanden Heuvel, in part because the vines are surrounded on three sides by the Dilmun Hill Student Organic Farm, the MacDaniels Nutgrove and an idle field. Students added a temporary sudangrass buffer on the east side of the planting to separate the vineyard from other crops that are not managed organically until a pine tree planting on that side matures. They also planted the other three sides of the vineyard with flowers designed to attract beneficial insects to help control insect pests. The Toward Sustainability Foundation has supported the start-up and ongoing management of the organic vineyard. For more information about the Cornell Viticulture and Enology Program, visit grapesandwine.cals.cornell.edu.